Dog Friendly Vacation Homes – Make the Most of Your Trip! If pet friendly hotels aren’t your thing, you may want to think about renting one of our listed dog friendly vacation homes. While Vacation Pet Friendly recently began adding listings, we are sure you will find one that is right for you and your dog. 1. Save money. Typically, vacation homes that accept dogs don’t charge by the day, they have a minimum requirement. This means that cleaning deposits are for the entire stay, unlike pet friendly hotels, which often charge by the night. 2. Dog friendly vacation homes often have yards, making it easier for Rover to get his exercise and take care of business. Many have doggie doors making even easier yet. This way, if you decide to go out for fine dining, take in a museum or visit a place that doesn’t accept pets, you are free to go without having to find a pet sitter or put your dog in a portable kennel. Some open up to large fields or meadows. 3. Most vacation homes are in good neighborhoods and near the center of the city’s activities. The tendency is for pet friendly vacation homes to be near or on the beach, in the mountains or in a happening area where there is a lot going on. Many have pools or open up to beautiful views of the ocean or mountains. Vacation Pet Friendly has listings of more than 300,000 pet friendly hotels. However, in addition, you can type into the search box Plan Pet Friendly Trips and find vacation homes, cabins and bed and breakfasts. Plus, our city pages include listings for pet friendly parks, beaches, restaurants, activities, events, attractions, tours, gardens, kennels, sitters and anything else that is pet friendly within that city. Because we are city based, it makes it easy to travel with pets. Check out our Travel Guide for Seattle as an example of how to make the best use of Vacation Pet Friendly. If you haven’t taken a trip with your dog yet, now is the time. 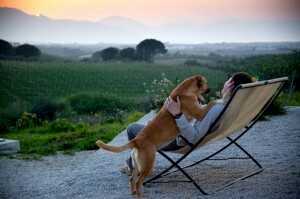 Read our Tips on Dog Friendly Vacations. America is more pet friendly than ever and Vacation Pet Friendly is here to make your travels easy and fun. The off season is particularly good for renting a vacation home where your dog is welcome, as they often go down in price so the owners can keep them occupied. No matter the time of year, it’s always nice to have a comfortable place to enjoy when vacationing. It was until the past few years that people began opening their doors to pet. But when the economy took a turn, they found they need to be more willing to accept pets if they were going to keep their properties occupied. Now, many have come to not only accept travelers with pets, but to embrace pet travel. That said, you may find plenty of home owners that leave special treats for your pooch, provide doggie beds, bowls and other special niceties. Have a wonderful vacation!